Holy Schmoley! I have some GREAT news to share with you! I am PREGGERS!!!! Internally I have been wanting a baby so I prayed to the universe and can you believe it happened!!! But really though I did recently become a mommy to a precious Silkie Chicken. Remember in my second to last post, Nola? If you have not seen her yet then you are in for a it because she is GORG! I can actually fit a onesie on her so I wanted to create a few summer onesies for her to show off this Summer. 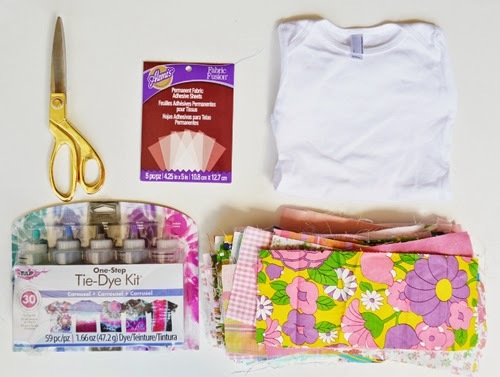 On the real though I know parent's can sometimes struggle with finding fun and whimsical clothes for newborns so I wanted to show you how you can make your own with some awesome products from I Love to Create. 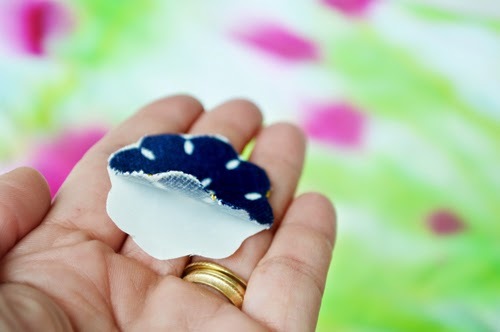 This is also a really great craft for kids to do. You could even let them decorate their own version of a watermelon or you could do a full set of fruits and veggies! How cute would that be! We will be doing two different onesies in this tutorial so don't forget to scroll to the bottom for the second one. 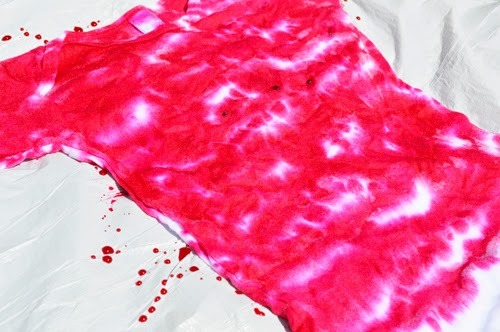 Now I don't know about you but I am in love with Tie-Dye. Maybe it's because I am an 80's girl and I can't seem to leave the 80's, HAHA! The first thing you will do is wet your onesie and twist out ALL of the water! 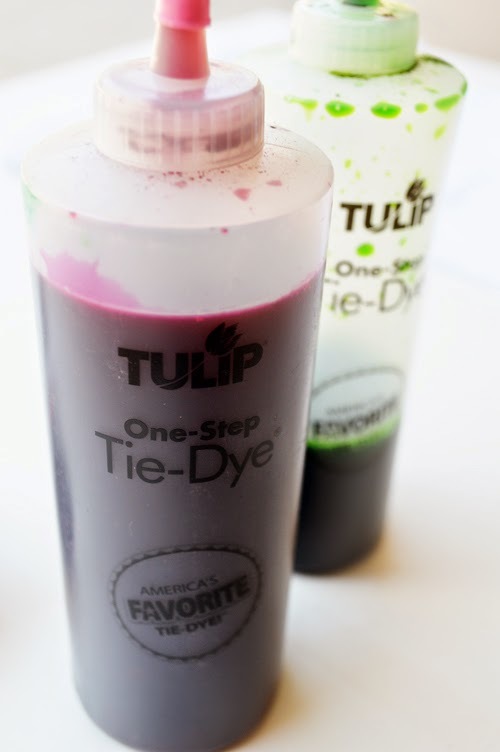 We are wetting it because it helps spread the dye out more evenly on the fabric and you don't have to use as much dye since you fabric is already wet. 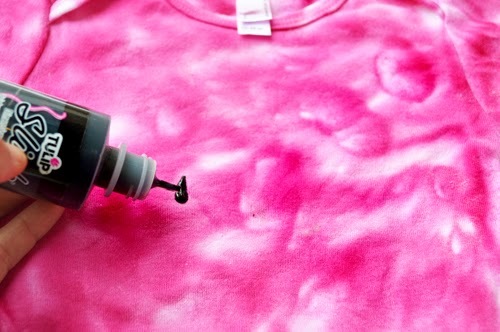 Our Tie-Dye instructions are super easy. The bottles come with powder in them and all you have to do is fill them up with water then shake! 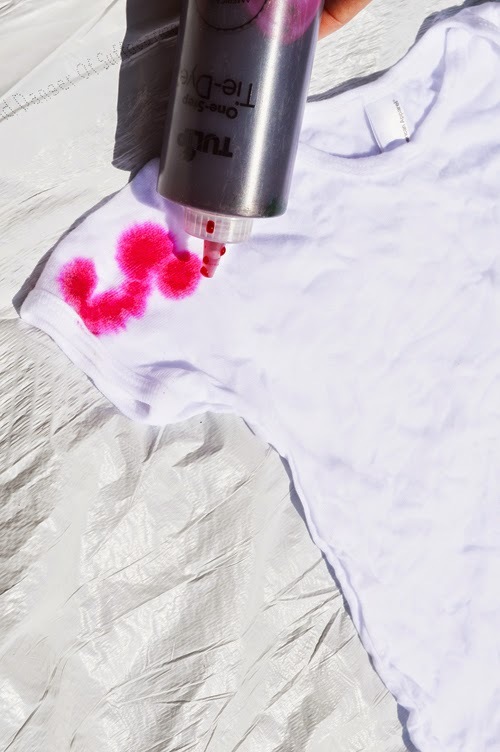 I started at the top of my onesie by squirting a little bit of pink dye over the damp onesie. You will notice it will slowly spread out so don't squirt too much at first. We want to keep a little bit of white coming through the pink. Remember we are making a WATERMELON! Speaking of watermelon I could sure eat a large one right about now with a sprinkle of salt. Remember to leave a little bit of white showing at the bottom so we can add our green dye in that space. 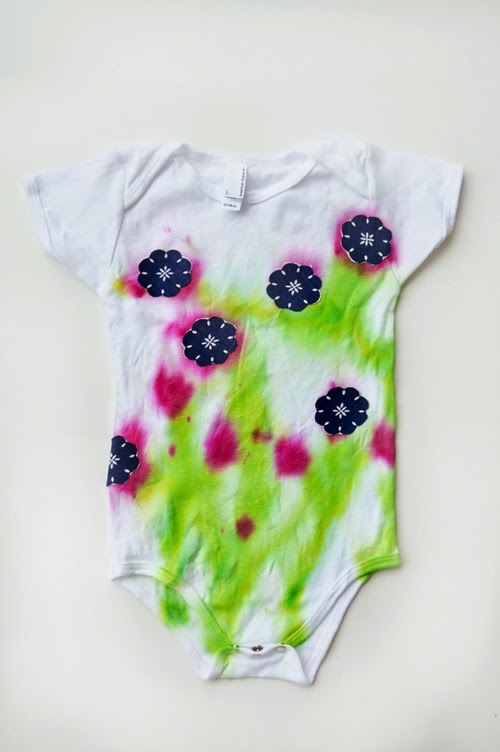 Once your onesie is DRY you can grab your black slick paint and add in the seeds. How easy! You could make a dozen of these in NO time and give them to everyone you know having babies. Trust me they will LOVE THEM! Don't forget to wet your onesie with water before you begin. 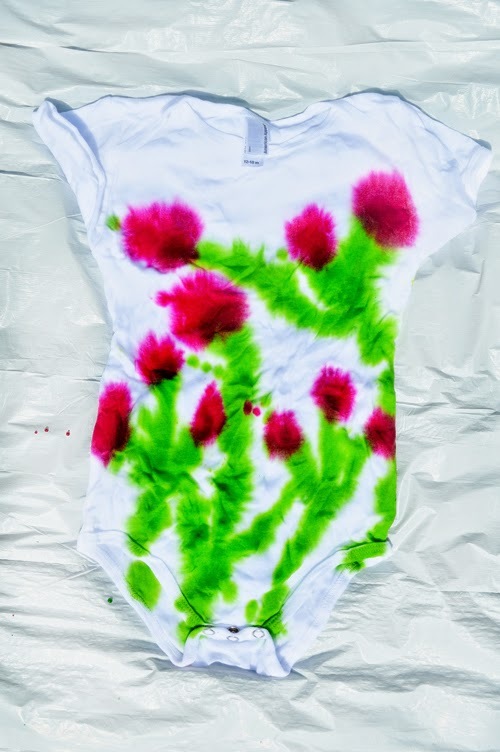 For this onesie we will be "drawing" with the dye onto the onesie. The first thing I did was add pink dots/circles then I added green "stems" to them. 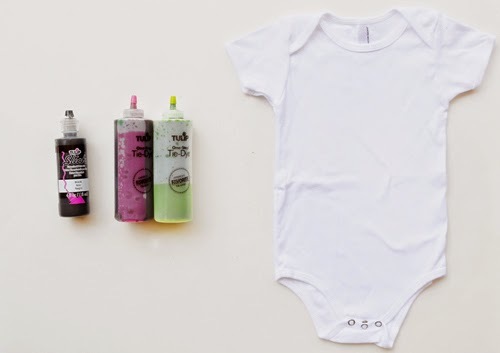 I wanted to keep this onesie a little organic and whimsical which is why we are "drawing" directly with the bottle. 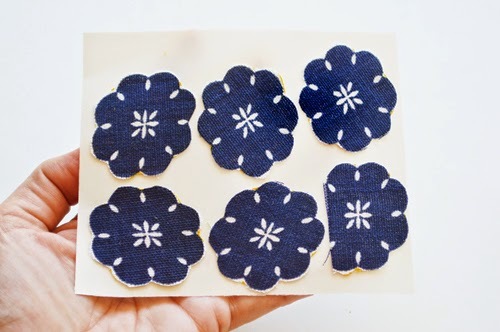 While our onesie is drying we will cut out flowers from fabric. This is the part that gets really fun. 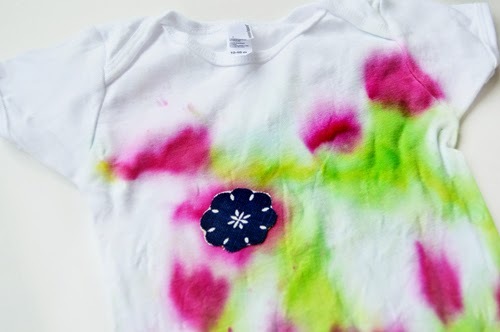 You can add a variety of colors or stick to one solid color, it's totally up to you! 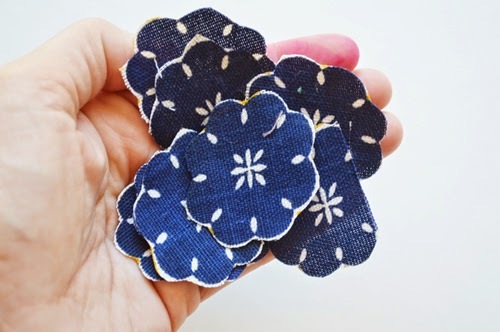 Once you are done cutting our your fabric flowers I suggest holding them in your hand and admiring them for a hot minute. 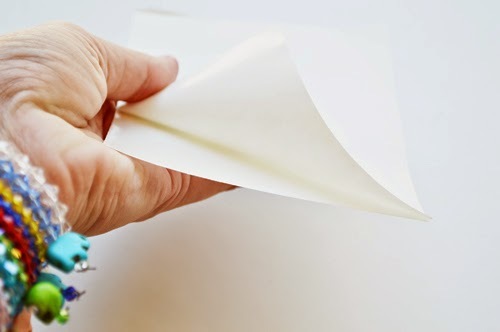 Grab one of your fabric adhesive sheets and peel off one side. You will now have a STICKY side. 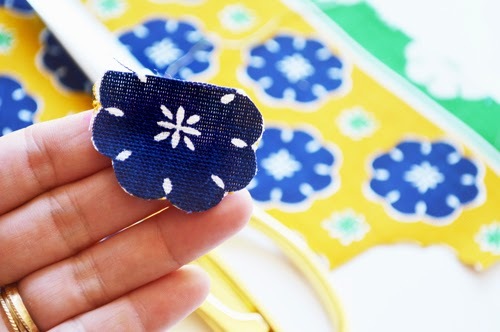 Carefully place your fabric flowers onto the sticky side (good side facing up) like I did below. Having fun yet! When you are done grab some scissors and cut the flowers out. I suggest using a good pair of scissors because sometimes when you are cutting the flowers out the exposed sticky side will stick to your scissors and that can make life really bad! Just kidding! Once you are done cutting flowers out you can peel the back off of the flower and what you will get is another sticky side. This side goes down on the onesie in those big pink spots. Don't forget these are fabric sheets so once you place them on the onesie you can wash it and they will NOT come off. I am telling you, this stuff is MAGICAL! 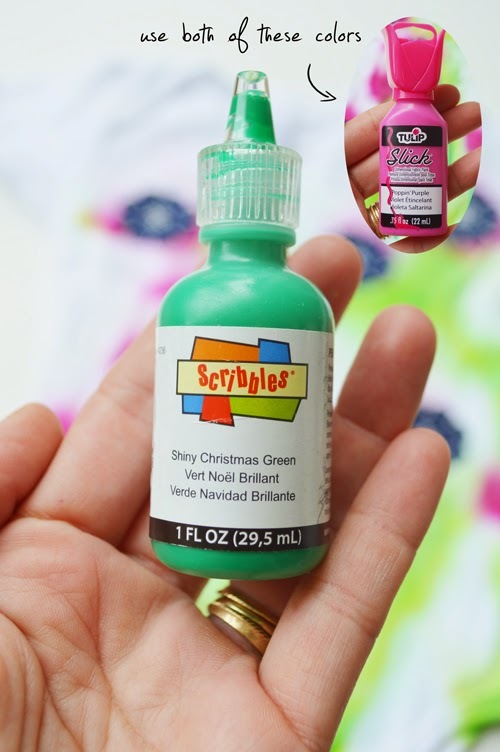 I used a little pink and green dimensional paint to dress it up. I didn't plan on using these two colors as you can see I didn't put them in my products picture. See this is the fun part about crafting, you never know when something else will JUMP into your head! This is what it will start to look like once you start applying the flowers. Tadahhh! 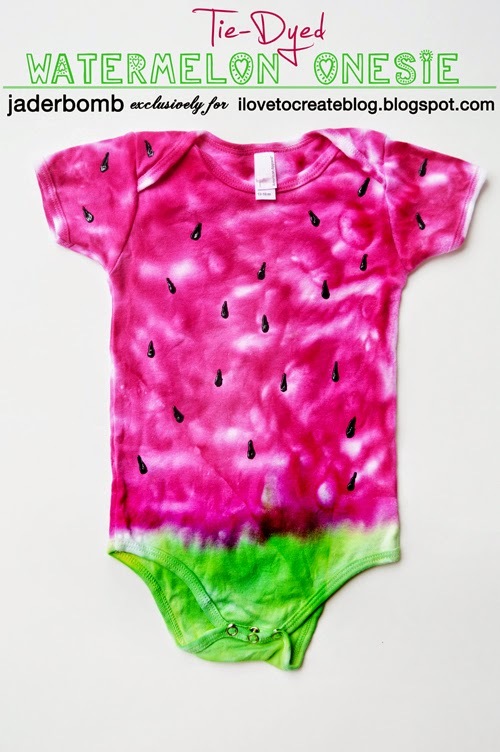 How cute is this onesie. I can promise you ONE thing, you will NEVER find this in ANY department store. 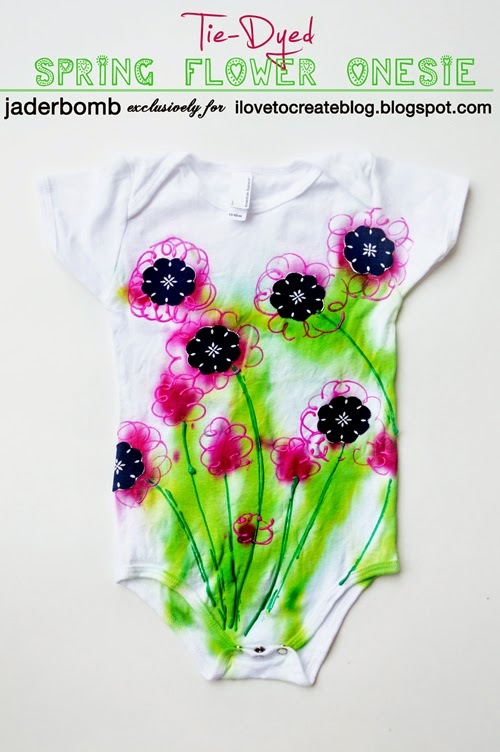 If you notice all I did with the pink paint was add swirls around the fabric flower and the with the green I added stems. Let them both dry completely over night and they will be ready to wash and use! I totally hope you enjoyed this tutorial because I had lot's fun making them. If you or someone you know has a baby problem.... Please get them some tie-dye and fabric paint. We promise this will help them out! See you in the next post! These are too cute. I have a 7 month old baby I will make this for him.